The leaves seem to change color just as the CSL kits do. New season, new teams, new titles and a new contender for promotion to the top flight and it all starts in the 2nd Division with the season opener pairing last year's bottomdwellers Panathinakos USA with FC Japan. Taking place at Randall's Island, the 2018/19 season of the Cosmopolitan Soccer League's 2nd Division began with FC Japan against Panathinakos USA in a 3-1 win for the Japanese. Both teams ended last season disappointingly amongst the bottom 3 teams in the Southern 2nd Division. FC Japan had a final table result of 8th in the South with only 2 wins, 3 draws and 11 losses, holding the 2nd most goals allowed with 61 in all 16 matches. They did make waves in the CSL last season for their shock win against Hoboken FC 1912, in turn ending Hoboken's previously 12-game unbeaten streak back in April 2018. Panathinakos faired even worse, languishing in last place in the South with 2 wins, a draw and 13 losses while letting in the most goals in the 2nd division at 71. Panathinakos are looking towards better days in the coming weeks to forget this opening loss, get results and climb up the table. The club formerly known as Sporting Astoria SC & then Sporting South Bronx, will now operate simply as Sporting Soccer Club this season as they start their campaign well against Brishna with a 3-1 win at Flushing Meadow Field. Brishna had the upper hand to their opposition last season by playing some great football. Ending up in 3rd place in the North 2nd Division with 29 points, some famous moments include their season opener 7-0 loss against Malatayaspor USA only to win the rematch away at Randalls' in a spectacular 6-5 result. Brishna, regardless of this first loss, are still no team to take advantage of. Sporting enters this season well, high hopes a-plenty after a runners' up medal in the CSL 2018 Summer League, leaving behind a disappointing finish to the 2017/18 season, aside from the brand new name change. With 4 wins and 12 losses in their 16 matches last season, their Reserve side, formally Sporting Astoria, surprisingly had a better run of it than their senior side with a runner's up medal in the Harry J. Saunders Cup after losing 5-1 to Kelmendi FC NY in the final. Head Coach Ed Romero's men will surely take away the positives from the performance today to use for the remainder of the season. The historic Manhattan Kickers return to the Cosmopolitan Soccer League D2 after being regulated from the 1st Division last season. They faced NY Ukrainians at East River Park Field and came out 5-2 winners. They ended their 2017/18 with 2 wins, 4 draws and 12 losses in the top flight. The Kickers are veterans of the league after being established in 1974, have hosted a squad of talented players from across the globe including Sweden, Spain and France throughout their history. Kickers Head Coach Bryan Baracaldo will hope to replicate their 2016/17 D2 season that saw them just lose twice to earn promotion to the top flight this time around and this emphatic 5-2 victory is a sure stepping stone towards that. NY Ukrainians ended up with 20 points in 6th place in the South with 6 wins, 2 draws and 8 losses back in early 2018. Goalscorers Andres Munoz and Yousef Alrobay couldn't spearhead the Ukranian side this time around like they did last season, putting on great attacking performances that managed to turn their negative goal difference of 5 from last season into a positive one this time. 2-time John Kilby Cup champions Club Deportivo Iberia started their campaign in good fashion against stiff competition Central Park Rangers Reds at Randall's Field 75 with the Galicians coming out 4-3 winners. While CPR Whites maintaining a lower mid-table position, keeping their 1st Division privileges for the season, isn't the worst thing to happen to the Manhattan-based club, they haven't made much progress in recent seasons despite playing well. The Reds ended up in 5th place in the Northern Division collecting 27 points with 9 wins and 7 losses, impressing in memorable victories against Brishna and FC Spring Valley. CPR will surely have to shake off their losses in both divisions with the Whites also picking up an opening day loss this past Sunday at Hoboken 4-0. Iberia didn't not have it easy against the Reds, a team they haven't faced in the league since May 2016. A respectable mid-table finish was all Club Deportivo could amass last season with a total of 22 points with 7 wins, a draw and 8 losses. They will aim for higher place come this Fall and hopefully another chance at a Cup since their win during the 2014/15 season. Promoted Metro Division 1 champs Williamsburg International FC had a memorable debut campaign last season, winning the Jack Flamhaft Cup. However, "the Doylies" couldn't start the season strong against Polish side Polonia Gwardia NY as they take a 2-1 loss. Polonia looked to take this game to their opponents and overpowered them to get their first W of the season but it shouldn't faze Williamsburg, who joined the Cosmo League in late 2013 as just another team searching for glory and to someday play the top flight. They now become a team to beat in the 2nd Division playing great football. Besides winning last season's Flamhaft Cup, they ended the campaign with 27 points from 8 wins, 3 draws and 5 losses. A striking partnership of John Kaddo and Team Captain Mark Gallagher together scored 37 goals for the club last season to earn top plaudits for goalscoring in the Southern Division. Polonia Gwardia NY played well against the Doylies and earned their first win of the 2018/19 CSL D2 season. The Polish outift persevered at all throughout the 90 minutes at the Bushwick Inlet and now sit in 4th among the top 4 in the South to collect a win in their opening games alongside teams like FC Japan and Manhattan Kickers. This is their first opening day win for the club since their inclusion in the league in 2016. The 2nd Division finds new competition in the shape of FC Ulqini, last season's champions from the Metro 1st Division. However, they couldn't handle their opposition Beyond FC as they lost 5-2. FC Ulqini, once known as Korabi Soccer Club, spent the last 3 seasons in the Metro Division while earning promotion in 2017/18 with their best performances yet, winning all 17 of their matches that season and scoring 68 goals while allowing 12 in the process, becoming the team to fear and expected champions. Ulqini Head Coach Agim Ceka was frustrated with the loss and looks to improve their strategies for their away game against NY Ukranians next Sunday. Beyond FC got just the start they were looking for, staying top of the table going into Week 2 of the Cosmo League 2nd Division. Back in 2017, on their season opening, CD Iberia blew past them in a 7-1 loss. They would end last season in 7th place in the North with 4 wins, 2 draws and 10 losses - collecting a measly 14 points. Time will tell if this is BFC's year for glory. The new kids on the block this year in the Cosmopolitan Soccer League are the club known as Real Olé FC. Thrusted into the 2nd Division, they had their work cut out for them with a season opener against D2 Championship runners' up FC Spring Valley and came out the victors. Before the match, the Cosmopolitan Soccer League spoke to Nick vonEgypt, the Director of Operations for Real Olé FC to get his insight on the landscape of the 2nd Division. Much of Real Olé are experienced & traveled players of the CSL, vonEgypt included, who have played for the likes of Lansdowne Yonkers FC who are 4-time & currently D1 champions, Doxa FC and many more. It showed at Bower Park this past Sunday where vonEgypt scored a brace, Patrick Alvarez, Ethan Eustace and Matt Nittolo were all the goalscorers on the day. This loss is a tough one to swallow but isn't much to judge Spring Valley on. After all, FC Spring Valley were one of the most entertaining teams in the Northern Division last season, making it all the way to the D2 Championship final against Hoboken FC 1912, only to lose 3-1. They collected 34 points with a record of 11 wins, a draw and 4 losses in 2017/18. Spring Valley's top scorer Omar Aragon is one of many strikers to look out for in their starting lineup this 2018/19 season. Finally, Alhoussain Bah, Ebrima Jallow and the rest of KidSuper Samba AC faced off against NYPD FC, who haven't won their opening matchday since September 2015. It turned into an easy win for Samba with them winning 8-1 at the Baker Athletics Complex. 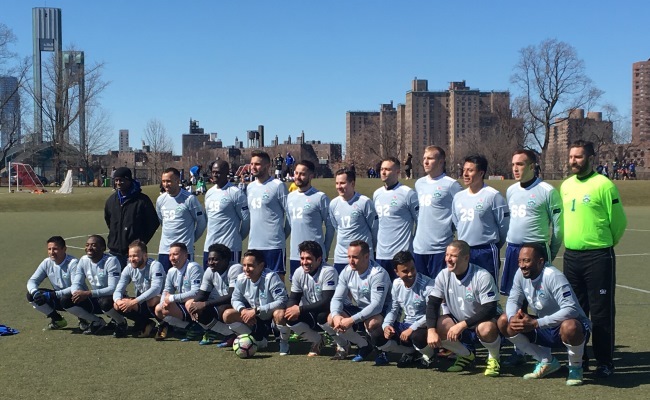 NYPD FC are disappointed at such a bad outing on the field with this 8-1 loss but their efforts during the off-season is keeping their heads straight this campaign. The team was superior in the CSL Summer League, winning the trophy and participating in charitable matches and tournaments around the world, from Nashville, Tennessee to Ecuador. With such good showing away from home, they surely have better games ahead in 2018 in the Cosmo League 2nd Division. Bah and Jallow were some of the best dribblers in the league last season and firmly helped KidSuper climb up the table with their goalscoring prowess. Jallow scored 18 goals in 2017/18 while Bah scored 12, the former earned the Silver Boot in goals scored in the Northern 2nd Division that season. Their efforts this time around earned them the win against NYPD and leaves KidSuper Samba on top of the North.